here at Inauguration of Navajo Nation President Russell Begaye & Vice President Jonathan Nez at Window Rock High School ‘Fighting Scouts” events center in Fort Defiance, Ariz.
Navajo Nation Chief Justice Herb Yazzie gave the oath of office to Begaye and Nez, who are now the president and vice president of the Navajo Nation at noon. when doing traditional Navajo blessing and dedication, we ask that there be no recording to honor the tradition. No pictures. Plain and simple, with honor and respect. Fomer Navajo Nation Vice President Rex Lee Jim does a Beauty Way prayer for newly inaugurated President Begaye and Vice President Nez. Minister William Lee is now giving a Christian blessing. 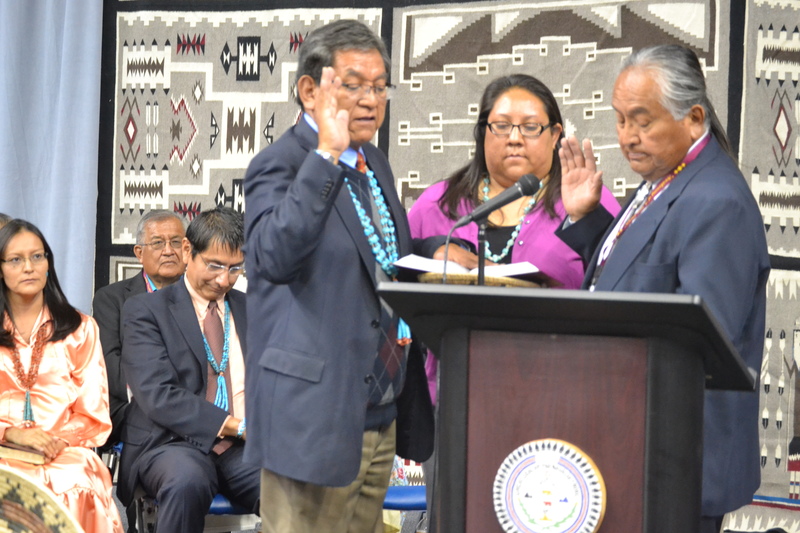 This entry was posted in News Articles, Professional Journal and tagged inauguration, Navajo Nation, President Russell Begaye, Vice President Jonathan Nez by Marley Shebala. Bookmark the permalink.